There are many ways to increase awareness about eye disease among Hispanics/Latinos in the communities you serve. You can hold events anytime throughout the year, and especially during cultural celebrations. Check out these ideas, including tips for using traditional and social media, and integrate a few into your educational and promotional efforts. Arrange for eye health to be the topic at a group meeting, charla (educational presentation or talk), or another community venue for learning and sharing information with Hispanics/Latinos. These can be scheduled activities that take place in community centers, worship centers, senior centers, health clinics, libraries, and even in people’s homes. Local community leaders will know when and where these activities take place. Distribute eye health information at community festivals or athletic events. Encourage local businesses, such as bodegas (neighborhood convenience stores) and grocery stores, to participate in eye health programs by distributing brochures, hanging a poster, or promoting your educational activity. 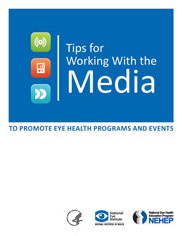 Ask local community newspapers to include articles or PSAs about eye health. Encourage directors of local Hispanic/Latino health education programs to incorporate eye health into existing programs. Develop in-service training seminars on Hispanic/Latino eye health at medical clinics and health and social service agencies. Ask hospital representatives to include information about Hispanic/Latino eye health in medical continuing education programs. Hispanics/Latinos come from different countries of origin, with distinct backgrounds, customs, and observances. As you develop your Hispanic/Latino outreach efforts, keep in mind cultural celebrations. The following are some observances and activities to consider as you plan your program. However, check with community members for other dates that represent the traditions of their countries. Día de los Reyes Magos (Three Kings Day) is celebrated on January 6, twelve days after Christmas. In most of Latin America, this holiday is sometimes as important as Christmas. Children usually receive presents on this day. Día de los Niños (Children’s Day) is celebrated on April 30 each year to recognize children as the center of the Hispanic/Latino family. Día de la Madre (Mother’s Day) commemorates and celebrates mothers. The date varies by country. Día del Padre (Father’s Day) commemorates and celebrates fathers. The date varies by country. Mes de la Herencia Hispana (Hispanic Heritage Month) is a national observance beginning September 15 and ending October 15 that celebrates Hispanics/Latinos with various ceremonies and activities. Día de la Independencia (Independence Day) commemorates the date a nation assumed independent statehood. In most Latin American countries, it is a national holiday. The date varies by country.